Thank you so much! These are so much fun to do. That texture looks like fun to play with! A combination of painting and sculpture…I see a structure, and it looks like it’s housing a party. Good way to start the day! Woot, sounds good to me, Kerfe! Molding paste. Well worth trying out, if you enjoy playing with color. And covering up a muddy art fail in the process. Bonus! Thanks, C! You could make a fabulous quilt with these colors. Oh wait, you probably already have! Love your play with color and structure. Thanks for the link to Chris Cozen’s page. There are so many fun things to do! Thank you so much, Carmel! Chris’s stuff is so inspirational! Have you ever worked with acrylics? I do have some Golden High Flow and some Daler Rowney inks. I have not played with them a lot. Do you watch any of the Strathmore Online free Workshops? The first one has just started and the artist is playing with Strathmore sketchbooks and preparing the pages with acrylic washes. The Art Ninja Guide Book! I’ve seen them, yes, but not these specifically you’re speaking of. Sounds so cool tho, thx for letting me know! I ordered recently a Golden sampler pack from Blick. S/b coming soon and I’ll report back….samples of their paints and mediums. Can’t wait to receive it & start playing! …wow. that’s the only word for it. Big hugs to you, Lance! Thank you, my friend! I’m having so much fun with these products, and hopefully the joy translates. I’m always so glad for your praise, as I would just keel over dead if I could paint like you. Thank you. Thank you, Kirk! I’m so glad you do! Thanks for stopping by, I know how busy you must be. Spring break coming? Or is it here? Basically it has come and gone. I’ve been off this week but grading. My next class starts Tuesday. Thanks for asking. So glad to hear it, thanks Catherine! Molding paste = FUN! So much fun Laura, can’t wait to sign up for the demos, I watched the few minutes of taster demos….how to frustrate one self, seeing some of the video and wanting more…then it stops, can’t wait for my two weeks off, lots of riding and painting, thank you for introducing me to the channels. I am, looking forward to sat chilling watching new videos to tempt me into buying more…..the extender medium that chris cozen uses already has me hooked ( best did out some acrylic paint from the shed, ready for some holiday play, unless something else tempts me between now and then)? Oh my! I love this, and the things I see in your abstracts lately. This one my first thought was, “shelves with lots of neat treasures!” I see a little doll sitting in a nook on the top shelf, books, and a sail boat. 🙂 It’s lovely! I would call this one The Toy Shop. 🙂 I love it! Very cool – and it looks like it was so much fun to do! Rachel, it was a blast! Thanks! I love your abstract. There’s a very playful quality here and the colors are fun too! Thanks, Laura! I had so much fun doing it! I think when art is play for the artist, hopefully it translates. So glad you love it! The texture of the molding paste makes the painting pop! Great colors, too! Wowza! This is awesome sis!💜💕😀 It’s truly mesmerizing! Such a wonderful piece and colors… I think I DO see the party Kerfe mentioned… and I want to go! (this coming from the guy who hates parties… it’s just that cool!). I wanna go too, and I don’t even see the party (or like them) LOL! I’m so glad you like this, Charlie! 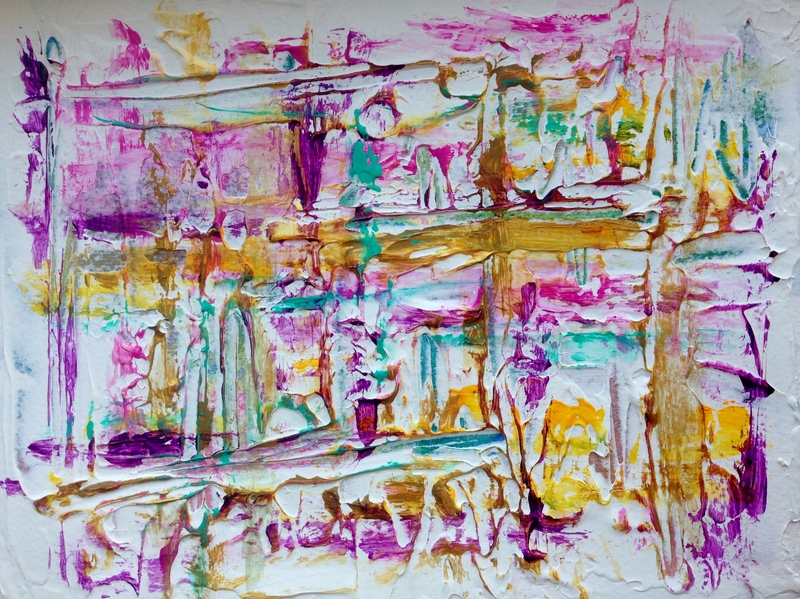 I am enjoying abstract work soooo much…..I can’t think of anything I’ve tried yet in this art journey that I’ve truly disliked. I like everything and wanna do it all! :))) *boing boing* and hearing your encouragement just ramps up the happy for me. Thank you for sharing your kind encouraging words, my bro & pal! hehe… yeah, it’s all fun isn’t it? Impossible to choose a focus most of the time! That’s why I love art! But your abstracts are truly wonderful… I sometimes don’t like abstract work because I don’t feel there’s a connection to the viewer (some abstracts seem too internalized as if it’s a private joke only the artist could explain and it doesn’t resonate with me). But your work has your bright personality in it… so it’s really inviting and pulls me in. Charlie, you are such a good brother. Thank you so much ((((((Charlie))))))). I really enjoy them! Who knew?! This whole journey is pretty mind-blowing most of the time! Call me strange, but I see ballerina’s! Interesting abstract, the diagonals add a nice composition element. Thanks, Mary! I’m learning a lot about composition. Still lots to learn, but I’m enjoying it! Looking forward to caching up. Can’t eat to see!!! Don’t wait. Eat dessert first! Lol! Thanks! This one was lots of fun. Love that molding paste! Thanks so much, Ann! So glad you like this!